I have always been enamored with the way farming unites people with the natural world. So it’s fitting that the internship I got to inform my graduate work at Bard College’s Center for Environmental Policy would be on a farm focused on maintaining synergy with nature. I’m working with the Hawthorne Valley Farmscape Ecology Program (FEP), a small research and outreach program in Columbia County, New York. FEP is located on Hawthorne Valley Farm, an organic, education-oriented biodynamic farm where the synergy between nature and agriculture is highly valued. FEP was founded in 2003 with the overarching goal of encouraging an informed compassion for the rural landscape of Columbia County through research and community outreach. The Program researches Columbia County’s history and ecology with the ultimate goal of fostering a sustainably productive and healthy future for the area, both for the county’s culture and natural environment. The program does this by running agroecological experiments, leading ecology walks with the community, and holding educational events, among other efforts. FEP sets an example for the type of habitat creation that is needed on many farms lacking habitat for beneficial insects like pollinators and beetles. In collaboration with the Xerces Society for Invertebrate Conservation and the Natural Resources Conservation Service, FEP is creating habitats with native species as their components, which serve the purpose of supporting invertebrate communities for their ecosystem service value to the farm as well as for their conservation purposes. 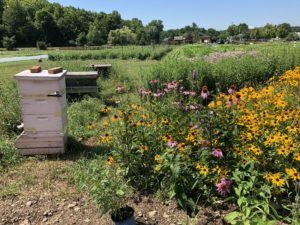 In my work here at FEP, I work in the native plant nursery to cultivate plants and then transplant them into areas designated as beetle banks or pollinator gardens located in and around the farm’s crop fields. Recently planted beetle bank in the Corner Garden at Hawthorne Valley Farm in Ghent, New York. Beetle banks: A form of biological pest control, beetle banks are a raised strip of ground planted with grasses and perennial plants. They are located within a crop field and provide the ecosystem service of pest suppression by supplying beneficial insects that prey on pests with overwintering habitat to ensure their presence within the crop field come spring. I spent one of my work days planting the beetle bank pictured here. 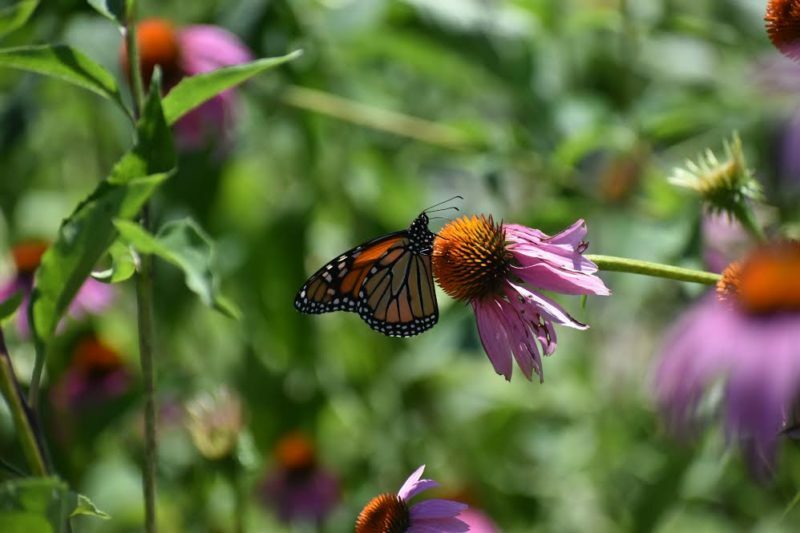 Beneficial insect garden: A garden planted with flowers that provide nectar for nourishment or pollen for pollinators to a wide range of beneficial insects. The garden pictured below was there when I arrived, but I have grown native plants in the nursery and transplanted others into this garden this summer. Beneficial insect garden and beehive in the Corner Garden at Hawthorne Valley Farm in Ghent, New York. 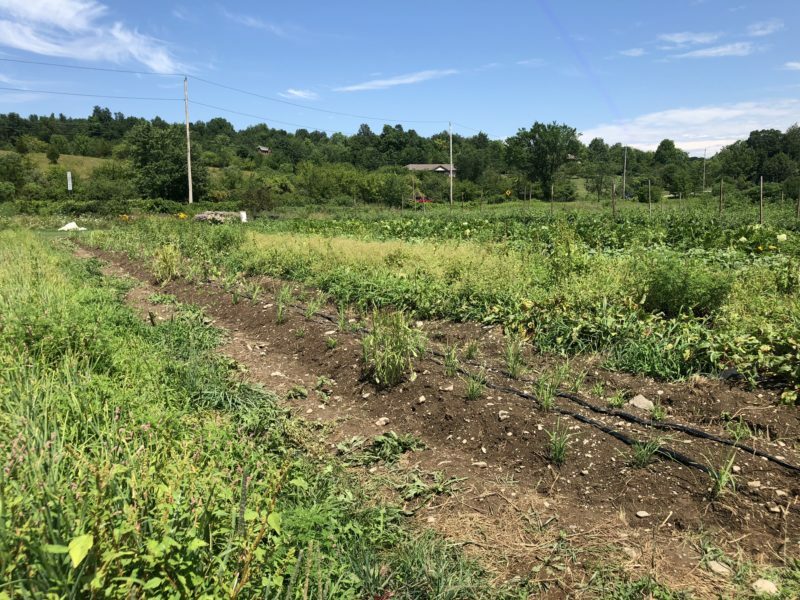 On field days, members of the FEP team (myself included) travel to the Hudson Valley Farm Hub to collect data on the Native Meadow Trials (NMT) that have been implemented by the FEP in collaboration with the Farm Hub and Xerces. Most of my indoor work is spent sorting insects and processing data from the Native Meadow Trials. 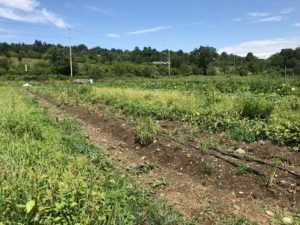 One land management goal of the Farm Hub has been to transform erodible, formerly tilled fields into permanent cover, providing an opportunity for ecologists to create habitat for grassland birds and beneficial insects. 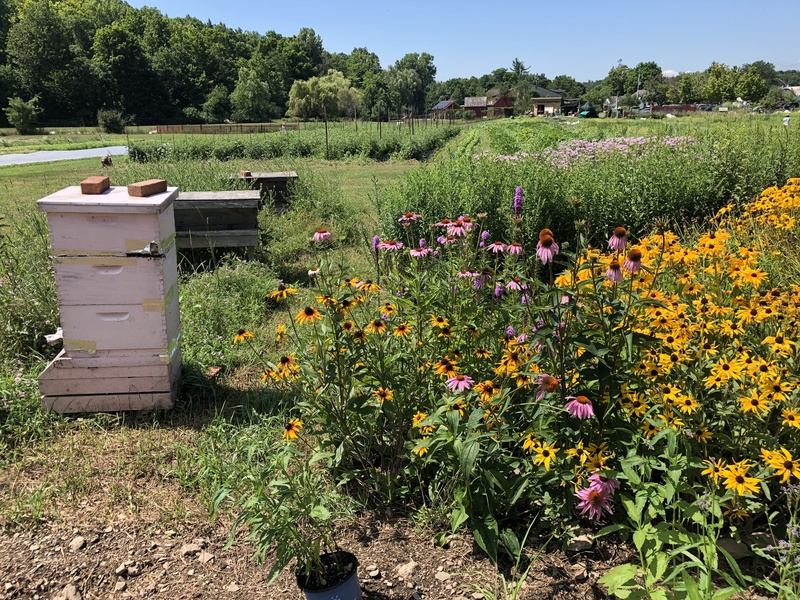 An outcome of this goal has been FEP’s Native Meadow trials, where FEP is comparing the influence of two different native flower seed mixes, including a control group with no seeds sewn, on the composition of insect communities collected using traps within the meadow trial plots. I have been helping to collect flower abundance data within the plots, set up and dismantle the traps, collect the insects, and sort the insects back at the field station. Needless to say, this internship has provided a feast for the eyes, especially considering my enthusiasm for the aethetics of flowers. Beyond that, however, it has granted me the opportunity to learn what it is like for ecologists to work with farmers to create habitat for beneficial insects. I now have a better understanding of what it takes to foster the relationship between farms and the ecosystems within which they reside. The melding of botany, taxonomy, agriculture and anthropology are necessary in this effort. In both nature and knowledge, diversity will help a system withstand the test of time. This is perfect farming to lessen the environmental pollution. Brenna, this is a great overview of what you are doing at FEP. It is so great to have this experience to inform and shape your future capstone research. Lovely pictures too!. I also have a very strong passion in sustainable agriculture and we do some researches on this back at home in Tibet. To foster the synergies between farmers and their land is definitely very crucial to focus on scientific studies what are the factors and how they are related to each other. But it also very helpful to collaborate with their indigenous knowledge on farming as well. It is amazing to see that you have the opportunity to do experiments an data collections to understanding the relationship and how they interact on another in a scientific way. This is what I always want to do and want to learn more about. Great article, thank you. Oh my! This is fascinating! I have always had a love for entomology so that aspect interests me quite a bit about what you are doing here. I was wondering – how would you gauge the efficacy of pest control due to predation? Would it be based on crop health and yield, relative insect populations, or both? I look forward to seeing more on this project! My attention was drawn to the beetle banks. I did a similar project for my senior research, but the plants acted as an alternative food source for pest. I like the idea of having plants to attract beneficial insects that could either act as pest management or pollinators. This also poses the idea of studying how these natural systems can work regionally, not only locally.